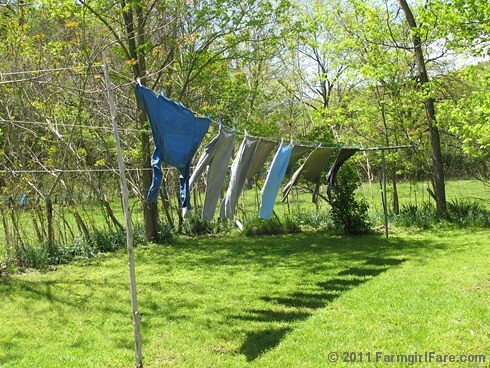 Farmgirl Fare: Thursday Farm Photo: Oh, Clear Blue Sky. Oh, Pleasant Breeze. Thursday Farm Photo: Oh, Clear Blue Sky. Oh, Pleasant Breeze. Oh, nice big dent in the laundry pile! © FarmgirlFare.com, pulling weeds, mulching mint, watching shadows on the grass and bouncing baby lambs munching grass (once they finally stop bouncing), admiring wild turkeys strolling through the hayfield, defrosting three sticks of organic butter for a late afternoon baking session (during the coming rainstorm) of Lemon Coconut Quick Bread (so good toasted!) and really easy Baby Shortbread Coookies with Mini Chocolate Chips and Toffee Bits—unless I get sidetracked snuggling cute little lambs of course. I have a pile of it myself.